There are still no trains north of Carlisle due to the Lamington Viaduct repairs and the replacement buses increase the journey times. I managed to slip away from work and catch an earlier train out of Lime Street Station than I had originally planned. At least part of the journey would be in daylight. 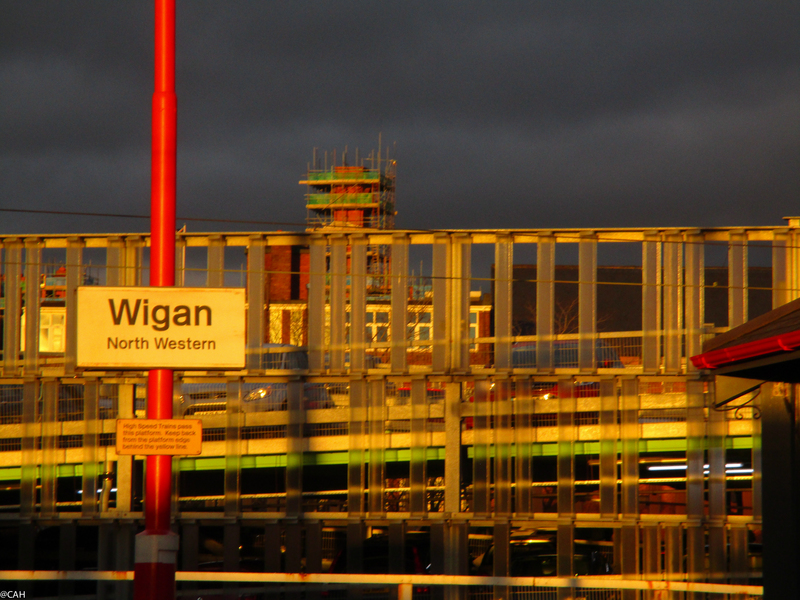 By the time we got to Wigan North Western, enough sun had penetrated the glowering clouds to produce that wonderful golden hour of light before sunset beloved of photographers. It made even the station and the adjacent rather utilitarian car park glow. At Preston we were kept waiting a driver whose arrival was delayed by floods. I finally finished reading Great Plains while on the train. I was pondering that I had already known something about the native Americans, the explorer and settler trails across the region, its geography, wildlife, the farmers trying to make a living there and the dustbowl. From the book I learnt more about the Mennonite settlers and something else that had not occurred to me: it is the location for several nuclear missile silos. In Carlisle, I was waiting for the bus to Edinburgh with a guy from London who had also been on my train. He said that he had just started work for Railtrack and that he had never been this far north before. On Wednesday I had work to do, a day of coffee and statistics. In the evening, I attended a Burns Night celebration at the Scottish Arts Club. I met several new people (including some of the botanic artists) and enjoyed some great food. We were entertained by several members with the toasts, some of Burns songs and some by James Hogg. At the end of the evening I got back to the flat by taxi and was physically exhausted but my mind was racing with ideas and plans for more creative work of my own. 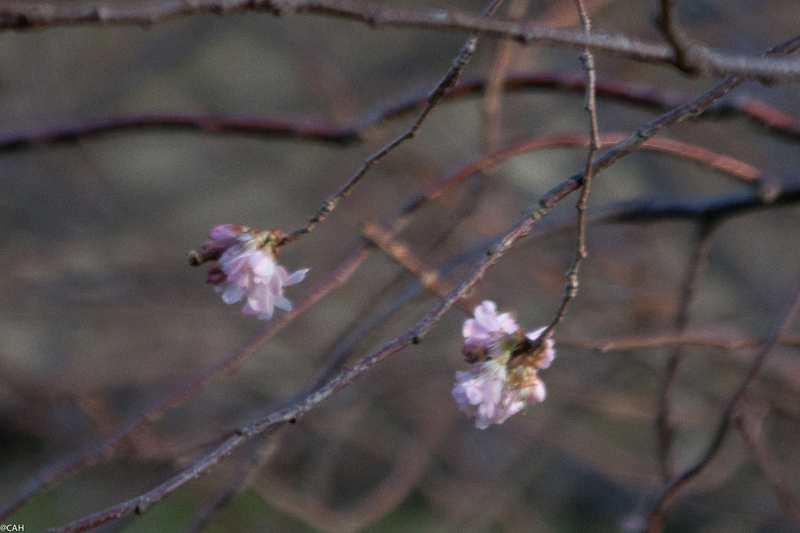 The first few blossoms are appearing on the cherry tree outside the window but from Thursday evening through Friday and into Saturday we were treated to gales, snow, hail and sleet showers, the remains of storm Gertrude which battered the eastern USA a few days ago. The snow on Saturday morning lay long enough for all the local children to be out on the Meadows building snowmen but it melted soon after when the sun emerged. The blossoms have survived the onslaught. One winter treat in Edinburgh is that the Scottish National Gallery puts on a display each January of Turner watercolours. 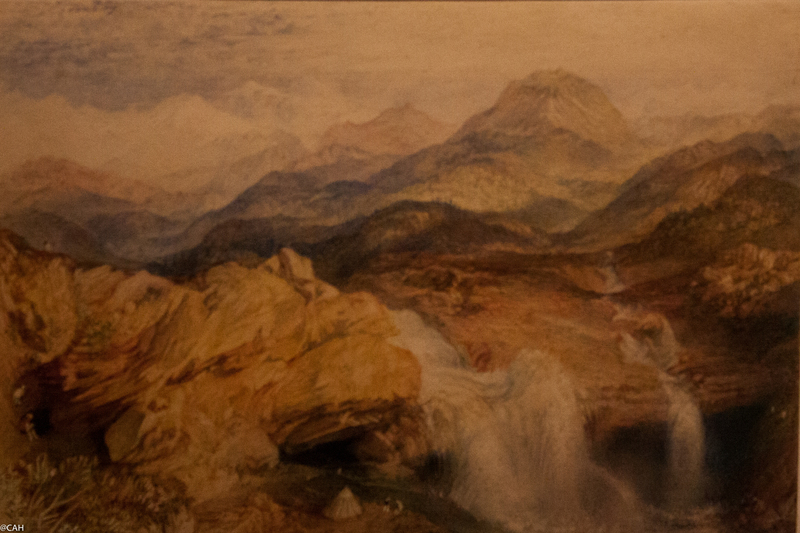 Although he never ventured further than Europe, here is one entitled ‘Falls near the source of the Jumna in the Himalaya. Saturday evening saw us having dinner in Katie’s Diner in Bruntsfield. There are only six tables and it is decorated with Americana including photographs of New York taken in the 1950s, musical instruments and also some more local colour from several Jack Vettriano prints. 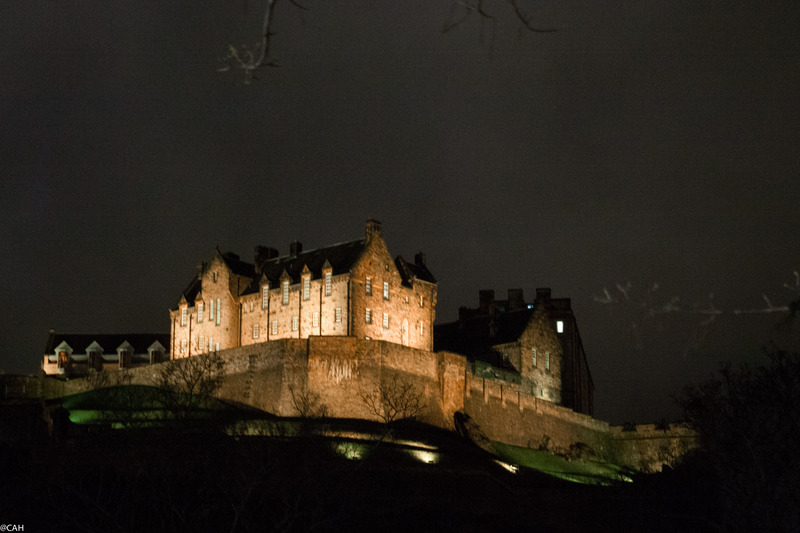 At night the castle is lit up and glows almost orange. 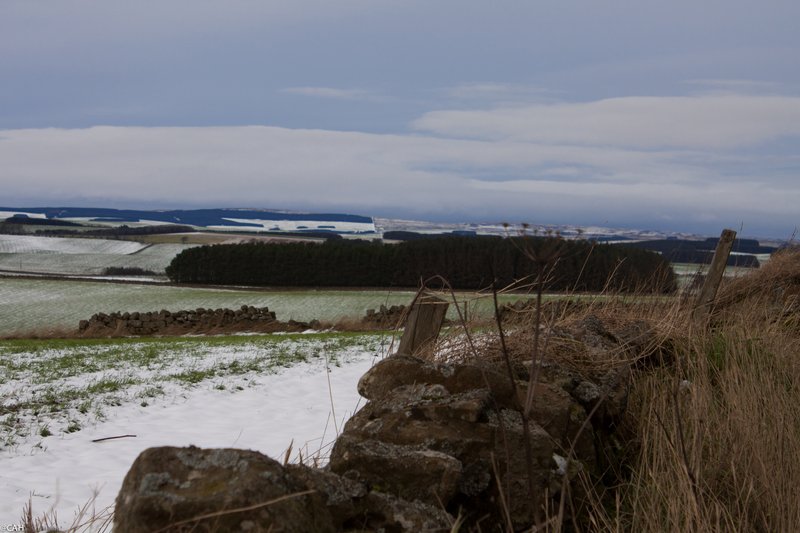 This morning it was time to head home so we wandered through the borders with flooded fields being enjoyed by swans and geese and some snow on the Lammermuir Hills but very little further south. 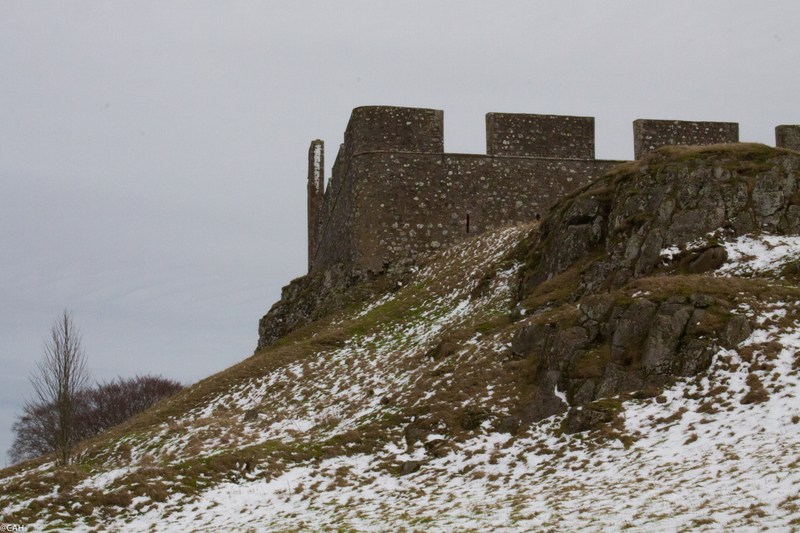 Between Greenlaw (one of only two towns in Scotland to have a village green) and Kelso, we came across Hume Castle. It is closed in winter and all you can see from the road are the 18th century walls which hide a much older keep. I made a note to re-visit in the summer. Just before we got to Kelso on the B6461 I saw a sign that said ‘Bookshop’. We did not explore further as it was unlikely to be open on Sunday but something else for the return visit. We were soon descending towards Carlisle, the border and lower altitudes. Snow-covered Cumbrian hills appeared above the cloud but fog and rain were with us for the rest of the journey.